Mid-Side: Creative Stereo-Phase filter+, Software Filter from G-Sonique. 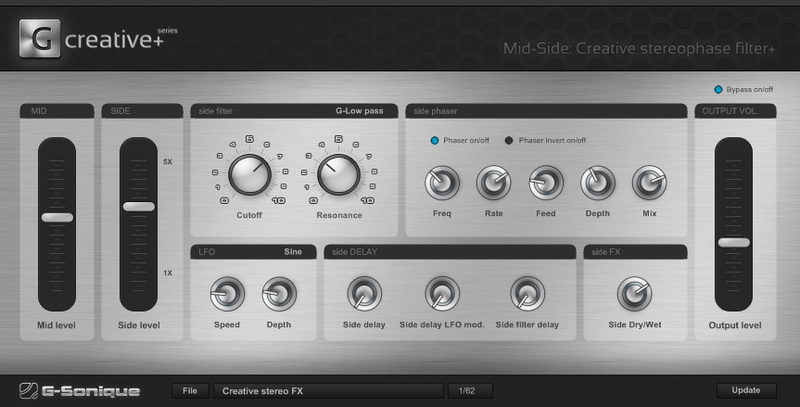 G-Sonique has released Mid-Side: Creative Stereo-Phase filter+, a VST effect unit for Windows that offers new ways of stereophonic sound modulation. 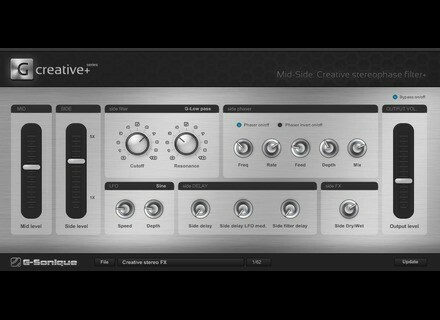 Mid-Side: Creative Stereo-Phase filter+ is designed to create 3D modulation effects with phasing / filtering and the illusion of effected sound that will fly around your head while the center (mid) of the sound stays untouched. Phase modulation unit (6 adjustable parameters). Time modulation unit with the possibility to delay the side part of the signal against the mid or delay the filtered signal against the side signal, and use a floating delay modulation of the side signal by a LFO. Analog sounding liquid filters (9 types available) and G-Filters, a series modeled after codes from DSP chips of hardware synthesizers and analogue low pass filters with "a creamy sound," again modeled after vintage hardware keyboards/synths which can be modulated by a free-running LFO (4 waveforms available). Phase modulation unit with adjustable parameters like frequency, rate, feed, depth, mix (dry/wet), phase invert. Time modulation unit with the possibility to delay the side part of the signal against the mid signal (side delay knob), delay the filtered signal against the side signal (side filter knob), and use a floating delay modulation of the side signal by a LFO (side delay LFO mod.). Analog sounding liquid filters with G-Filters, a series modeled after codes from DSP chips of hardware synthesizers and an analogue low pass with a sound modeled after vintage hardware keyboards/synths: G-Low pass, G-Band pass, G-High pass, Low Pass, High Pass, Band Pass, Band Reject, Peaking, Analogue low pass, None. Cut-off and resonance knob which can be modulated by a free-running LFO (4 waveforms available). Bypass for comparing your track with and without the effect. Dry/Wet knob for setting how much of effect will be applied. Preset manager with 60 example presets. Mid-Side: Creative Stereo-Phase Filter+ costs €16.90 but the first 100 customers can get it for €10.90. Free Detunized Live Pack Waschsalon: Visit at the Laundromat. Detunized releases Vlamba Live Pack for Ableton Vlamba is a set of 7 Ableton devices that are based on the sounds of a bowed and plucked Viola da Gamba. Siliconbeats Releases Industrial Cinema Drums V1 Sample Pack These loops are described as "positively evil, dark, distorted, nasty and a little bit scary."